The schools of Architecture and Urban and Public Affairs are in the final phase of an integration that will strengthen academic and research opportunities under the new College of Architecture, Planning and Public Affairs (CAPPA). The UT System Board of Regents approved the creation of the new college Thursday during its regular meeting in Austin. Nan Ellin, founding dean of the new college, says CAPPA brings the best of both schools to the forefront of education and research. The college will incorporate six professional degree programs—urban planning, public administration, public policy, architecture, landscape architecture, and interior design. 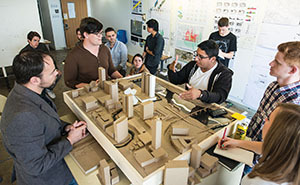 Read more about the College of Architecture, Planning and Public Affairs. This year’s Commencement ceremonies were bigger than ever. 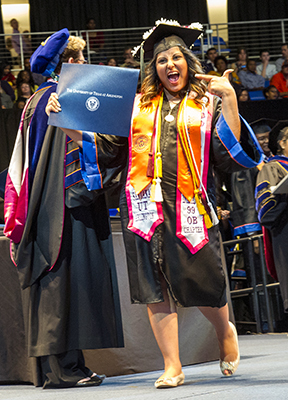 On May 14-16, some 5,000 students claimed their degrees at College Park Center. The Class of 2015 includes approximately 3,500 undergraduates, 1,400 master’s students, and 100 doctoral candidates. See more Commencement photos. Or watch a video roundup as well as full-length individual ceremonies. The next consultation day is 10 a.m.-noon and 1:30-3:30 p.m. Wednesday, May 20. Email keishaware@uta.edu to reserve a session. Complete the required form by noon today, Tuesday, May 19. The forms are available by email and in the Student Legal Services Office, Room 216, Davis Hall. The Office of Information Technology will perform maintenance on the UTA campus network infrastructure midnight-3 a.m. Sunday, May 24, and Sunday, May 31. The maintenance is expected to disrupt network communication within campus and to the Internet. Plan now to accommodate an electrical outage 6 a.m.-6 p.m. Sunday, May 31. Facilities Management has scheduled the outage to complete major electrical updates in Davis Hall, Fine Arts Building (Mainstage Theatre only), Central Library, Life Science Building, Physical Education Building, Preston Hall, Science Hall, Smart Hospital, Texas Hall, Trinity House, and University Hall. For those buildings with emergency generators, power will be supplied to support egress lighting, life safety, UTA Police dispatch, and all research facilities currently connected to the generator. All buildings will remain locked during this time. • Clean out all refrigerators and freezers before leaving Friday, May 29. • Turn off all electronic equipment including computers, scanners, and copiers before leaving Friday, May 29. These items do not have to be unplugged. If you have questions or concerns, special requirements during this time, or newly established research that must retain power, contact either Toby Buhrkuhl at 972-832-1490 or Jeff Johnson at 817-798-8456. 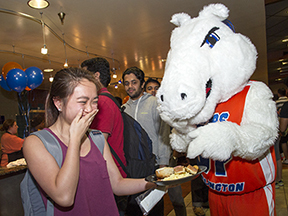 Blaze, right, inspects the plate of Ally Nguyen, nursing freshman at Late Night Breakfast last week at the Connection Cafe in the E.H. Hereford University Center. On Friday, May 22, parking lots 26 and 27, south and east of Maverick Stadium, will be used by attendees of the Special Olympics 2015 Summer Games. • 6:30-8:45 a.m.—Lot 33 (northwest area) to J.D. Wetsel Service Center. • Midday—Wetsel to lot 33 by van. • 3:15-5:30 p.m.—Wetsel to lot 33. See the parking and shuttle maps for other parking options. Contact Parking and Transportation Services at parking@uta.edu or 817-272-3907. Lot 49 between Cooper and West streets and south of Mitchell Street will close at midnight Wednesday, May 20, for the Special Olympics 2015 Summer Games. Remaining vehicles may be subject to towing at the owner’s expense. The parking lot will be closed for repairs Monday-Tuesday, June 1-2. Remaining vehicles may be subject to towing at the owner’s expense. 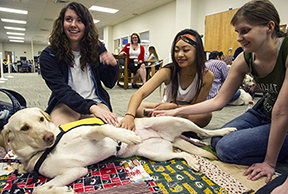 Stress therapist Maddie endorses belly rubs and back scratches for relieving stress last week during final exams. Participating in the Paws for Finals exercise at the Central Library are, from left, Jennifer Cline, nursing freshman; Sally Thach-Le, biology freshman; and Lindsey Duffett, psychology junior. Lots F9, Trinity, Trinity South, 30, and 33 will be used for the Mejia Ballet event parking at Texas Hall beginning at 5 p.m. Saturday, May 23, and 10:30 a.m. Sunday, May 24. Parking staff will collect a fee, but UT Arlington annual permits will be valid. Contact Parking and Transportation Services at parking@uta.edu or 817-272-3907. TrailBlazer moves to a summer schedule after this week. Keep up with campus activities throughout the summer on every other Tuesday. The next TrailBlazer is June 2. Weekly editions return Aug. 18 for the fall semester. Deadline to submit transfer course work for spring 2015 graduation. Summer intersession and the new summer 14-week session in the College of Nursing and Health Innovation begin Wednesday, May 20. Class dates are online. To register for summer intersession and the summer 14-week term, click on the Additional Search Criteria link on the schedule of classes page. To be considered for spring 2015 graduation, the deadline to have all your transfer course work submitted to the Records Office's graduation desk is Wednesday, May 27. See other graduation deadlines. Arlington Technology Association Lecture John Promise, formerly with the North Central Texas Council of Governments, presents "Shaping the Region: Why Fort Worth Is Not Dallas (and Vice Versa)." He will describe the personalities and geographic factors influencing the cities’ development and highlight their growth challenges into the 21st century. Light breakfast provided. RSVP. Free. 7-8 a.m., Room 100, Nedderman Hall. Arlington Technology Association. Athletic honors: Senior sprinter Clayton Vaughn, left, is the first Maverick to be named the U.S. Track and Field and Cross Country Association's Division I Male National Athlete of the Week. Mya Anderson, top right, and Nina Villanueva were named to the Sun Belt All-Conference second team by College Sports Madness.com. UTA punched its ticket to the 2015 Sun Belt Conference Championship with a 7-6 victory Thursday over Texas State in San Marcos in the first game of a three-game series. Seniors Travis Sibley and Levi Scott combined for five hits and five RBIs. The Mavericks dropped the final two games of the series, 4-1 on Friday and 22-8 on Saturday. UTA finished the regular season with a 23-30 overall record and a 14-16 conference mark. The seventh-seeded Mavericks take on No. 2 Troy in the first round of the Sun Belt tournament Wednesday, May 20, in Troy, Ala.
Senior sprinter Clayton Vaughn last week was named the U.S. Track and Field and Cross Country Association's Division I Male National Athlete of the Week. He is the first-ever recipient from UTA. Vaughn ran one of the fastest wind-legal men’s 100-meter dashes in NCAA history to win the Sun Belt Conference Championships in 9.93 seconds. It’s the fastest wind-legal time by a collegian this year and is tied for the fourth fastest ever. With his 9.93, the Sulphur Springs product shattered his own school record of 10.07 set last year and established a new Sun Belt meet record, smashing the old mark of 10.12. 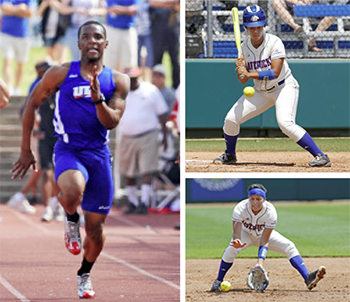 Vaughn competes next at the NCAA West Preliminary Round on Thursday-Saturday, May 28-30, in Austin. Senior Nina Villanueva and junior Mya Anderson have been named to the Sun Belt All-Conference second team by College Sports Madness.com. Villanueva hit .408 to achieve the second-best batting average in single-season history, while her career average of .363 is also second. The shortstop broke the single-season mark for runs scored with 52, and her 44 RBIs rank second for a season. Anderson’s 13 home runs tied her for second in a single UTA season. The designated player batted .331 with 41 RBIs, 47 hits, and 33 runs scored. • The doubles team of Elizabeth Thoms and Angeles de los Rios will represent the Mavericks as automatic qualifiers in the 2015 NCAA Division I Women’s Tennis Championships beginning Wednesday, May 20, in Waco. • The men’s outdoor track team ranks No. 27 in the latest U.S. Track and Field and Cross Country Coaches Association’s national poll.